I'm terrible at Christmas. Birthdays too. When it comes to gift giving, it is rare I make it to the finish before dropping hints to the recipient as to the present that's been purchased with them in mind. In dire cases of eagerness, I end up breaking down and giving presents early. It might be smart for me to purchase two sets of gifts at the get go. The trouble is, I get so excited at the giving, that I fail miserably at the waiting. In the case of sugar buns, I waited as long as I could. That ends today. I was hesitant to mention another butter-sugar-and-oh-have-some-more-butter bread when we were on with brioche so recently, but when those brioche were welcomed with such enthusiasm I tucked such qualms aside. Plus, sugar buns don't need my help. They state their own case. I've been making sugar buns for a good while now. And before that, I had a long history with cinnamon rolls, including a dark period in high school involving a scandalous fling with those monstrous ones they sell at the mall. I'm not proud. I returned to homemade for a time, until we parted ways after a disappointing batch one Christmas morning. They only returned to our circle when Benjamin, my eldest, had a less-than-impressive meet-n-greet with a cinnamon roll from a shop. I attempted to salvage their burgeoning friendship by baking cinnamon rolls with him, thus rekindling my affection anew ... which was stoked ablaze soon after with an introduction to Tartine's morning buns. That proved the tipping point; cinnamon-sweet breakfast breads and I were back to spending time in each other's company. I tried the Tartine recipe with croissant dough. I saw somewhere the suggestion of swapping in Danish dough, and thought it an excellent one. Then I found a like-minded individual who suggested a cheat's method for Danish dough, and it proved to be what I was really looking for. 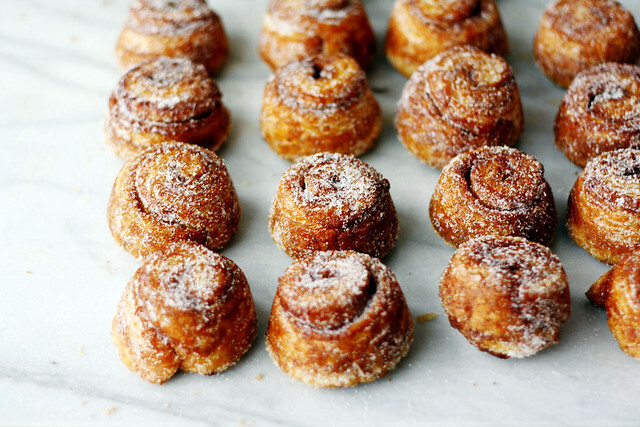 Laminated doughs, rather than the bread dough usual for cinnamon rolls makes for a pull-apart delicacy that traditional buns sometimes lack. An addition of whole wheat bread flour encourages softness and adds weight, and almond extract contributes a mellow something or other that reminds of bostocks when it meets up with the orange zest that spikes the filling. I double down on that nuttiness, upping the ante with browned butter too. Speaking of that filling, it's rare I go for cinnamon alone when baking. Which is surprising, as again back in high school I was big time crazy for Big Red gum, and thought cinnamon hearts better than chocolate. In those dramatic years, it was the full hit of cinnamon and nothing else. At present, however, I consider cinnamon best in combination with the other aromatic, warm-bodied spices that share a shelf by our stove. And so, nutmeg, cardamom and ginger tag along. And thus we began a kinship with these sugar buns. As for the moniker, sugar buns comes from Benjamin; who, in his six-year-old wisdom, declared the final tumble in granulated sugar is what makes these buns his favourite. Since he was part of the reason I welcomed cinnamon rolls back into our kitchen, he deserved the honour of naming. With inspiration from a variety of sources. 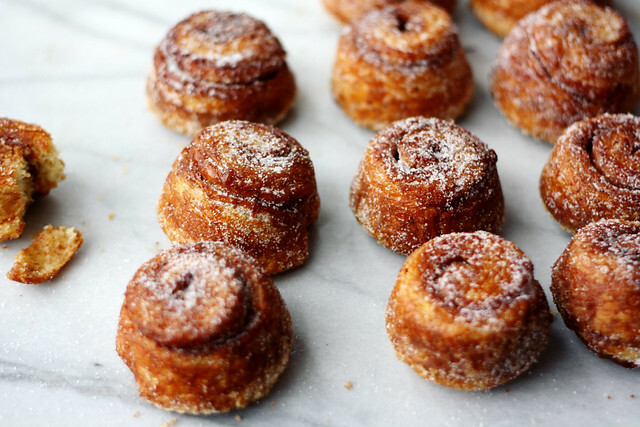 They're cinnamon rolls mashed up with the morning buns from Tartine Bakery and Café, along with a touch of a bostock, in accordance with the specifications of the sort of pastries my family likes. 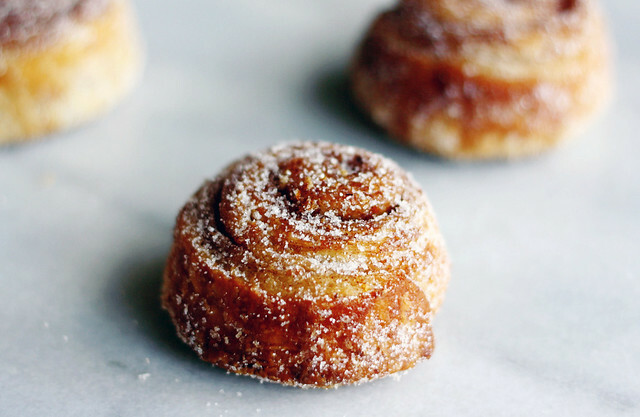 Just a head's up, the Danish dough requires at least an overnight rest — so plan accordingly. Combine sugars, zest, spices and salt in a small bowl. Set aside. Brush the wells of a 12-cup muffin tin (see note) with a thin film of browned butter, using maybe 1 tablespoon in total. Set aside the rest. Coat the wells generously with granulated sugar, tapping out excess. Set aside. On a lightly-floured work surface, roll your Danish dough to an 8x20-inch rectangle. Brush the remaining browned butter across the dough, leaving a 1/2-inch border on the long sides. Sprinkle the sugar mixture evenly atop the butter. Press the sugar lightly into the dough. Starting from the long side closest to you, carefully roll the dough into a tight log. Once completely rolled, pinch the seam to seal. Turn the rolled dough onto its seam and cut into 12 equal portions. Turn each slice onto one of its flat sides, and press down lightly to level. Place slices in prepared pan. Set aside to rise in a warm, draft free spot until just about doubled in size, around 45 minutes. Meanwhile, preheat an oven to 375°F (190°C). Bake the buns until puffed and golden, around 20 minutes. Immediately turn the buns out onto another sheet pan. Carefully flip buns right side up, cool until just manageable to touch, around 5-10 minutes. One by one, roll the hot buns in a small bowl of granulated sugar, coating completely but shaking off excess. Best when eaten still warm. For ease of baking, 12 buns work best. However, my preference is to make 14, cutting the dough into 1 1/2-inch slices and dividing the buns between two muffin pans — one 12-cup and one 6-cup. I like this size as they stay neat in the tins, and make for the (slightly) more modest bun as seen in the photos. The is a whole wheaten adaptation of Nigella Lawson's Food Processor Danish Pasty Dough from How to be a Domestic Goddess, which I make by hand (a modest effort for less dishes). It can, of course, be pulsed together in a processor instead. In a small pitcher or measuring cup, stir together the water, milk, egg and almond extract, if using. In a large bowl, whisk together the flours, salt, sugar and yeast. Scatter the cubed butter across the flour mixture. With two knives or a pastry cutter, cut the butter into the dry mix, as you would in making biscuits or pastry. Stop cutting once the butter is distributed but chunks still visible. Make a well in the centre of the flour mixture, then pour in the milk/egg mixture. Stir quickly to bring everything together into a messy dough. It won’t be pretty, it will be shaggy and sticky and uneven. Not to worry. As long as the flour is all combined, it is ready to go. Cover the bowl with clingfilm and refrigerate overnight, or as much as two days. When ready to proceed, bring the dough to room temperature. On a lightly-floured surface, roll out the dough to a 20-inch square. (The dough may be hard to work with on the first rolling, but it will get silkier and easier with each turn.) Fold the dough in thirds, as with a business letter. Turn the package 90 degrees counter-clockwise, so that the closed ends are to your left. Roll out again to a 20-inch square, and fold again, then turn. Repeat the process of rolling and turning 3 more times, 5 folds and turns in total. If the dough seems to be getting sticky or greasy, chill briefly in between turns. Wrap the dough in clingfilm and refrigerate for 20 minutes before using, or freeze for a later date.